Content. It has been the buzzword since my return back into New Eden’s fold almost a year ago. After almost five years of ‘sobriety’ I had relapsed and found myself in space yet again. No one ever really quits after all, or so it would seem. It struck me as odd to come back to an EVE in which wars, fights and all manner of space violence was classed as something so arbitrary. I remembered the use of the term “gudfites” back in the late 2000’s, describing a variety of violence visited upon unfortunate victims of larger or better equipped opponents – thus being more of an ironic term. This new term ‘content’ – however – seems to be used eagerly and without sardonicism by almost anyone to describe happenings which provide occupation and entertainment for those involved. Sure enough, speaking of content today guarantees that almost everyone understands what you are trying to convey. It describes a concept rather than any particular activity and that makes it immensely useful, and yet it feels artificial. The current and past political landscape, in particular the formation of power blocs in EVE, has been discussed at length. I have had the pleasure of reading a number very well put-together pieces on the subject matter that both filled in a lot of the gaps left by spending five years under a proverbial rock, and explored the consequences and various related themes. Therefore I do not wish to discuss the topic of bloc formation and the kind of content specifically related to that. Instead, my intention is to examine ‘content’ itself, in particular why it feels artificial or even fake. Before I begin in earnest, however, a disclaimer: I am woefully ignorant of anything but nullsec, and will therefore only be discussing nullsec content. As much as nullsec may be seemingly full of players that have no intention of ever initiating any hostilities towards another person, the majority of nullsec dwellers strive to be entertained with space violence. For many, this is why they play EVE to begin with – to pop or be popped; to beat the other guy; to demonstrate the supremacy of one’s own organisation over another. As empty as nullsec may appear, there are a lot of us. Vast droves of players that need to be kept busy and entertained lest they abandon their organisation for greener, more gratifying, pastures, and thus jeopardizing the continuity of the corp/alliance and/or its holdings. 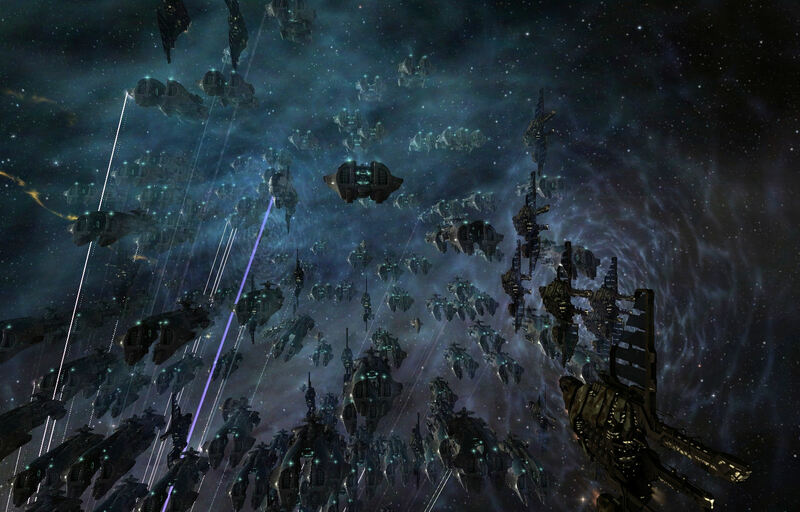 In the past, wars were the number one content provider in EVE. Be they territorial, fueled by grudges over past wrongs, over resources or cultural differences, they were as manifold as the reasons for which they were fought. Today, they appear to be dying out. The Imperium sits firmly established within its borders, the Drone Regions are back in the hands of XIX and Solar Fleet, and while the western and southwestern parts of the map are constantly changing colour, there doesn’t appear to be much actual fighting over space. One notable exception has been the conflict in the southeast between Red Menace Coalition and the Drone Region Federation, resulting in the first loss of a major staging system by defending forces – C-J6MT, ancestral home of Red Alliance. Today’s campaigns are vastly different from how they used to be. Where the wars of old were often an immensely emotional undertaking, with spirits high and tempers flaring, today’s campaigns are practically conducted dispassionately and with almost abject efficiency. Were this the real world, that would be a good thing. The past few months has seen the Imperium conduct almost war-game like campaigns to Providence and Cloud Ring in an effort to test the new sovereignty mechanics, stomp on alliances with alleged malicious intentions and, most importantly, provide content for its members. 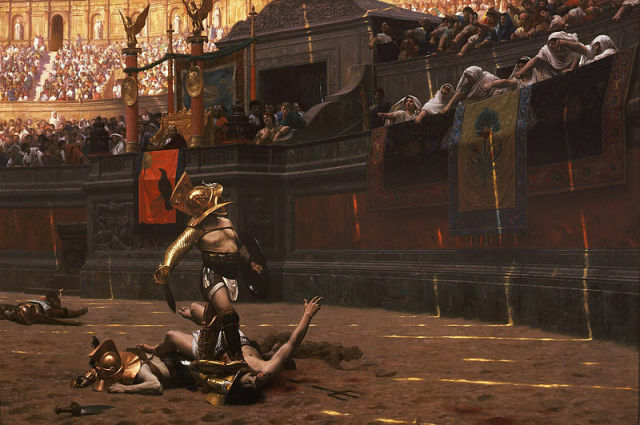 I cannot help but be reminded of the ancient Roman policy of ‘panem et circenses’ – bread and circuses to appease the plebs, to distract the general populace with superficial entertainment from any real issues. Other entities that have previously been at the center of major conflicts have abandoned all claims on space and settled into a nomadic lifestyle. Drifting from one hotspot to the next, or simply waiting to be called by some or other group who feel they’ve got more on their plate than they can handle. In a way, this is the laziest of type of content an alliance can provide for its members. The population of such alliances as Pandemic Legion or Northern Coalition reflects that. A handful of dedicated people work to find the content while the rest of the members stand by to log in from various other games. Even lazier, however, is letting others do their content-finding for them. Time and time again, alliances who find themselves in over their heads during their current conflict reach out to these entities, in hopes of garnering their favour and deciding a battle with their assistance. For the nomadic entities, this provides almost risk-free content with zero commitments – the risks are taken by those that call on them. One could argue that this allows the ‘little guy’ to one-up the big bullies in EVE, often unexpectedly, but when even alliances such as XIX call upon NC. to assist in a conflict where they already outnumber their opponents, one begins to question the validity of that sentiment. Additionally, since the nomads often feel they owe little to no loyalty to those that call upon them, the very same alliance that was helped last month may be on the receiving end of such a surprise visit the month after. It can be argued that calling on nomads for assistance does nobody any favours other than the nomads. Furthermore, these interventions by erroneously called ‘3rd parties’ tend to have a content-curbing effect on whichever conflict they have meddled in. Any fight from then on out has the proverbial Sword of Damocles hanging over it, that more unexpected guests could arrive at any time. No amount of scouting and preparation can remove that nagging feeling in the back of an FC’s mind that they may have missed something or not thought of some way that would allow for a repetition of the last disastrous appearance of a nomadic entity. Often it is easier to play it entirely safe, risk less or nothing rather than hazarding another setback. Another interesting factor is something I like to call the demystification of adversaries. EVE has been up and running for years. Players have moved between alliances, allegiances have shifted, friendships have been forged and treaties broken. Empires have risen and fallen to ashes. For the most part though, the prominent players remain the same. The knowledge they carry persists in this universe, as do many of the friendships and bonds between them. Even with new players joining the game and rising through the ranks of various organisations, it is not uncommon to find a former brother-in-arms in one’s crosshairs, a former corp-mate across the table or at the side of a new adversary. Even if their organisation is new, the players are often familiar. Similarly, the players themselves grow and mature. Those who started in their teens are in their early to mid-twenties now, no longer hormonal adolescents, but young adults who are finding their path in life. Over the span of a couple of years, we’ve attempted to stabilise our lives, and arguably our EVE careers too. Many grudges are left to fall by the wayside as the alliance they were associated with crumbles, leaving behind shared experiences between players who have moved on and grown from past conflict. The consequences are subtle but significant. No longer is your opponent an unknown factor, reduced to red squares on your overview and scoffed at with remarks on Reddit. He’s no longer a great big evil that needs to be vanquished; instead he’s someone you know from a common a channel, or perhaps even shared a beer with in Reykjavik or Vegas. He becomes known, and real emotional conflict between familiar parties becomes more difficult, even unlikely. A humanised enemy is no mortal enemy. Conflict, while it may still happen, takes on the qualities of jousting: a friendly contest between fellow combatants rather than the gritty, gruesome combat of a Crusade. Merely the cultural barrier provides any meaningful opacity when entities of vastly different cultural background or language clash. This is most often seen when a primarily Russian alliance clashes with a western one. Yet even there the cultural barrier is diluted, if you will, by individuals who are proficient in other languages and possess cross-cultural competences. Therein lies the crux of my impression of current content. While large blocs and alliances are working to appease their player-base with forced, artificial campaigns which often lack any real motivation other than content for its own sake, nomadic entities are sitting back and let others do the legwork for them. With EVE growing smaller – in a cultural sense – as the community grows more interwoven and blended, with diplomatic ties spanning years, being cemented by EVE meet-ups and surviving well beyond their initial purposes, we are living in a time where conflict has little to no meaning any more. Gentlemen’s agreements, even between entities who outwardly share no positive standings, ensure that neither will threaten the other. Instead of the mutually assured destruction of the cold war we know from our world, we get mutually assured non-interference with occasional assistance and farcical conflict on the side. Meanwhile, any true, genuine conflict is squashed by the benighted interference of the very same homeless entities that are currently unmotivated to hold space of their own. Driven by the short-sighted yearning for instant gratification, they ensure that no authentic struggle can result in the emergence of a new power. At this point, as others have attempted to dissect the subject of meaningful content, a resolution was often expected from CCP themselves. After all, is it not up to the developer to fix the game? Should there be more incentives for holding sovereignty? Yes. Would the game benefit from more artificial conflict drivers? Probably. Were we speaking of any other game I would agree that the responsibility lies with the developers. However, this is EVE – the game where every ship you pilot is built by another player, every shot you fire has consequences, and history is written by players. We have created the environment we find ourselves in now, and only we can be the ones that change it for the better. An adaptation in attitude would go a long way towards creating a more dynamic, less disingenuous content environment. Specifically those parties currently either too afraid, too lazy or too apathetic to get involved and play for keeps should consider their impact not just on the game but also their enjoyment of it. EVE is a game in which losses are real, the fruits of one’s labour go up in smoke more often than one would like and, as always, old habits die hard. A change in mindset that moves away from risk adversity and towards more risk-taking is certainly not easily achieved. It’s never easy to accept loss. Putting one’s work on the line is no casual thing when it comes to corps, alliances and influence; but I ask you this: What use is that enormous alliance SRP wallet if not to ensure that your loyal pilots need not fear the heat of battle? What use are your accumulated stockpiles of warships if not to fuel the fires of hard-earned victories? How accomplished will you feel knowing your battles are pre-decided and your triumphs ring hollow? In the end, this game thrives on conflict. Real, genuine conflict with all the emotional ups and downs it brings along with it. While the real world needs stability to prosper, EVE needs true, meaningful content. EVE’s history is written in blood. Dare to write some. Soraya Kha'marr has been playing (and not playing) EVE since 2006. As a proud member of The Initiative., he sometimes FCs (mostly from the backseat), often theorycrafts and always enjoys a long EFT session. Most recently he's taken up writing more or less coherent pieces on EVE.